Will abundant cash supply poop the m-wallet party? Without a doubt, digital wallets have been the biggest beneficiary of Prime Minister Narendra Modi's November move to scrap high-value banknotes. The resultant cash crunch brought thousands of borderline and non-users into the ecosystem, something that would have otherwise taken a few quarters. Data on payment systems released by the Reserve Bank of India (RBI) prove this—digital payments, particularly mobile wallets, picked up pace in November, with usage peaking in December. M-wallets saw as many as 213 million transactions in December compared to November's 138 million, an increase of 54%. The December numbers seem even more stellar in the light of the fact that the November figure was almost 40% higher than the previous month's. 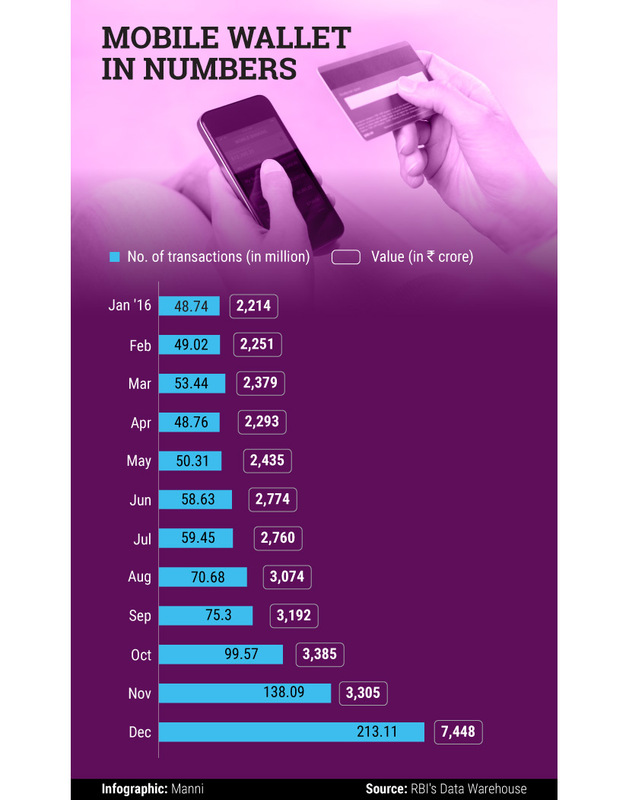 In value terms, m-wallets clocked a mammoth Rs 7,448 crore in December, up from November's Rs 3,305 crore. All in all, mobile wallet usage experienced decent month-on-month growth till November, after which adoption skyrocketed. Here's a look at the annual data. Mobile wallet companies, including market leader Paytm, MobiKwik and FreeCharge, are also laughing their way to the bank. Paytm claimed to have 177 million wallet users in December 2016 doing close to 7 million transactions every day. MobiKwik says its user base stood at 45 million, and it did an average of 3 million transactions a day. Snapdeal-owned FreeCharge also claimed to have 40 million customers, though it didn't reveal the daily transaction numbers. In February 2016, however, it had claimed to hit 1 million transactions a day. Note that m-wallets fall under the prepaid payment instruments category, which also includes PPI cards and vouchers. The RBI has given licences to 48 non-bank entities to operate prepaid payment instruments in the country. To be sure, the adoption of mobile wallets is on an upswing. But the bigger question is, was the recent surge one-off? And once there is enough cash in the system, will usage taper off? Payment Council of India member Deepak Chandnani, who is also CEO of Worldline South Asia and Middle East, a global leader in the payments industry, doesn't think so: "We see month-on-month growth of over 50% in wallet usage in December, but in January, there has been a very small de-growth of -1%. As cash supply increases, we expect a certain section of people will revert to cash for small-ticket transactions. However, if they have experienced the convenience and ease of m-wallets, many could become sticky customers. Monthly growth may not be as voluminous as in December but there will be further growth in the segment." All that wallet players need to do is try and retain the customer, now that there is a large base in terms of both users and merchants, Chandani adds. The RBI had on Wednesday announced that it would remove the cash withdrawal limit from ATMs and savings accounts starting March 13. It is beyond doubt that easy availability of cash will poop the party for m-wallets somewhat. 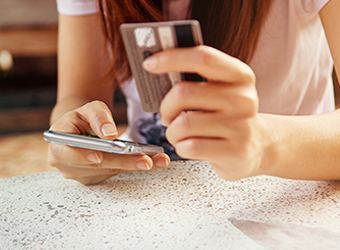 But Sunil Kulkarni, joint managing director, Oxigen Services, feels that the total value of transactions will keep rising given the vast majority of merchants and customers are yet to adopt mobile payments. "India has a 30-million-strong retail universe, but only 1 million merchants are using digital payment terminals. The transaction numbers for November-December are only from those 1 million merchants," Kulkarni says. "The numbers will obviously go down once the cash comes in. But the transaction volume per se is expected to go up because there have been more sign-ups happening from new merchants and propensity of customers to make digital transactions will rise," he adds. Bipin Preet Singh, CEO of MobiKwik, agrees, "Digital payments just reached out to 10% of Indians so far and there is a long way to go. We are certain that the industry will continue to grow at a remarkable pace." Experts have pointed out that the government's Unified Payment Interface (UPI), formally launched in August 2016, has the flexibility and ease of use that could see it topple mobile wallets. Interestingly, the BHIM (Bharat Interface for Money) app, which is UPI-based, had crossed 3 million downloads within a week of its launch and facilitated half a million transactions. Given the intense competition within the space and the slew of government initiatives, there is a lot of exuberance around mobile wallets. But unless wallets rethink their offering, they are going to run out of business, Sanjay Khan Nagra, senior associate at law firm Khaitan & Co recently told Techcircle. In cognisance of this, MobiKwik, a pure-play wallet player, is looking to expand its basket. "We are working towards becoming a one-stop solution for all financial services, where we enable masses to access everything from loans to investments," Singh says. Clearly, the idea is to distinguish one's product so that it doesn't become an also-ran in the crowded payments segment. Bunching additional products and services appears to be key here. Kulkarni of Oxigen—which has a stronger offline play—stresses that offline will be the game-changer. "Players just focussed on digital to digital wallet loading will be impacted, and hence will have to start shifting to other areas. This game is likely to be played not just in the online but also in the offline world," he points out.